My outdoor experience began in high school with a co-ed scout group which made a 10-day canoe voyage through the Quebec wilds. I've been backpacking since college in Pennsylvania. I have hiked 1/4 of the Appalachian Trail and 2/3 of the Pacific Crest Trail. My typical trip is in the Sierra Nevada from a few days to a few weeks long. My base weight is lightweight at 15 lb (6.8 kg) while still using a tent, stove and quilt. Longer mileage summer trips are now stoveless. The Bridgford Pepperoni and Cheese Pizza is packaged with two slices per pouch with a serving size consisting of one slice. Each slice is individually packaged in an MRE (Meal-Ready-to-Eat) brown wrapper with nutrition information printed on the outside. The Bridgford Mexican Style Beef Wraps are packaged with two wraps per pouch with a serving size consisting of both wraps. 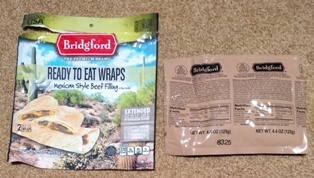 The two wraps are packaged in one MRE wrapper. The Bridgford Pork with BBQ Sauce Wraps are packaged similarly to the above wraps. My initial impression was that the packages appeared similar to what I had seen on the website. 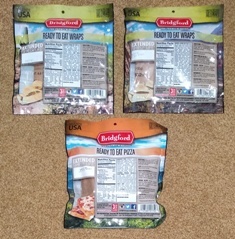 The outer packaging is a thin plastic pouch which has a tear open notch and inside is two packages in MRE-style heavier packaging in the case of the pizza and one inside MRE package in the case of the wraps. I have to admit that it was confusing to me on the website to figure out how many servings were contained in one package. These meals all appear under the website heading of '2-count on the go packs' with the description of 'each pack contains two sandwiches'. This is fine but still didn't really clarify to me whether '2 sandwiches' was one or two servings. 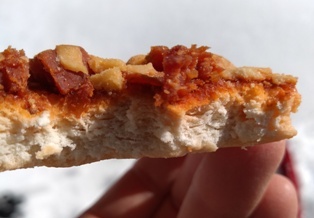 Anyway, it was confirmed when they arrived that the pizza serving consists of one slice thus making the package hold two servings while the wrap serving consists of 2 wraps thus making a package hold one serving. If I was ordering these online (which I would be since I was unable to find them locally), then I would have ordered half as many wraps as I wanted. I realize that serving sizes are not uniform and vary by individual, but having two-packs that consist of both one and two servings is confusing to me. The tear open notch worked easily to completely remove the top of the package without scissors and without any struggle to get a good tear. For backpacking, I'll plan to remove the outer packaging in order to save weight and for more compact packing inside my pack. The inner MRE packages certainly seem stout enough to not worry about a breach. 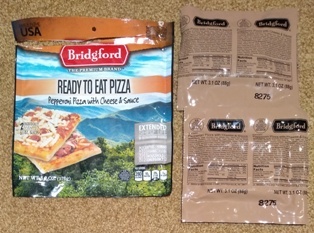 The MRE packages are not resealable, so in the case of the pizza that should be fine. One slice at 270 calories would make a good meal for me. I'll have to see if I can eat both wraps at one sitting or if I'll have to find a way to store one or share one. I was happy to see that each serving contains between 10 and 18 grams of protein. Nicely done! Each variety packs a pretty hefty amount of salt which is ok by me since I am usually sweating and drinking a lot of water and need to replenish quite a bit of salt to keep my electrolytes balanced. I was surprised at the amount of sugar in the BBQ wrap versus the Beef wrap but I'll have to see how that plays out in taste. I will wait until I'm out in the wilderness to eat these meals. The instructions state that each of the meals can be eaten directly from the pouch but also include heating instructions. The types of heating include MRE/Flameless Heater, Boiling Water, Microwave and Toaster Oven. 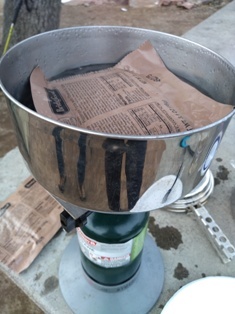 Since I don't have an MRE heater and will be on the trail, I'll plan to use the boiling water method. This says to immerse in boiling water for 6 minutes prior to opening the pouch and eating. This seems like quite a long boil time so I'll plan to carry some extra fuel. I typically rehydrate meals which only require getting water to a boil and then pouring it over the meal. I use a 900 mL (30 oz) pot which I'm not sure will be large enough to easily heat the meal pouches, but we will see! The pizza fits better than the wraps but maybe I'll have to turn the pouch over midway. I'm used to backpacking in warm weather without using a stove at all in which case these meals would be just fine eaten cold. Well, assuming that I like the taste! When hiking in areas with limited water, this would be particularly helpful since I wouldn't need to use any of my precious drinking water for hydrating meals. 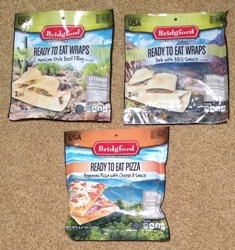 The Bridgford Pepperoni Pizza, Mexican Style Beef Wraps & Pork BBQ Wraps are ready-to-eat meals in secure packaging that can be eaten cold or heated. How do they taste eaten without heating? I ate the Bridgford Meals both cold and heated in conditions ranging from the snowy mountains to the warm desert. 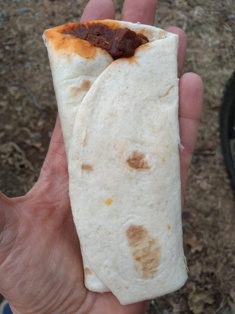 I first took one of the Mexican Style Beef Wrap packs with me on a mountain bike ride. It packed easily into my daypack with no fear of getting squished since the package is already pretty smashed to begin with. At our lunch break I pulled it out and was able to easily open the MRE pouch with one tear. Inside were two small smashed wraps. I didn't have a stove for any heating so this would be an 'eaten cold' test. I pulled one out and took a bite. Hmm. That is not bad...not bad at all! The tortilla is a typical white flour tortilla and the filling is more of a meat paste with not many identifiable pieces of meat like chunks or strands. I like spicy food and this wrap was mildly spiced but with enough flavor to be good. I have to admit that my expectation bar was set pretty low but I found the wrap to be downright yummy. After one wrap, I was satisfied enough that I didn't want to eat the other one so I shared it. I admit that I did eat an energy bar for 'dessert' and some carbs for the continued ride, but I just wasn't in the mood for more of the same food with another wrap. I ate the other Beef Wrap during a trip to Arizona while we were base camped. Taking advantage of having a 'car-camp' type large pot and lots of propane fuel available, I decided to heat this one in boiling water per the Bridgford recommendation. 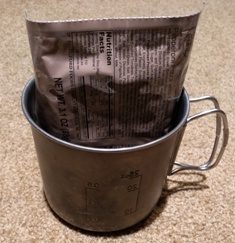 I boiled the MRE pouch for 10 minutes (longer than the 6-minute recommendation) and flipped the pouch halfway through the heating. 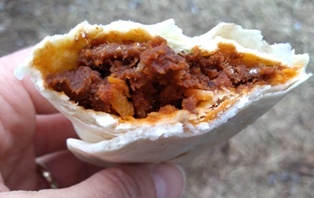 The wraps were very tasty and with the warm tortilla and filling, they definitely tasted better than eating them cold. But overall the improvement in taste wasn't worth the effort for me. Plus, for backpacking it wouldn't be feasible for me to heat them. My cook pot is just too small and the extra fuel necessary wouldn't be justified for me to carry. 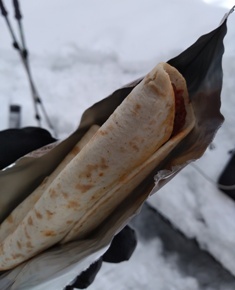 I ate one of the BBQ Pork Wraps on a snowshoe day hike. I carried it in an inside pocket in hopes of warming or at least not allowing it to get colder prior to eating. 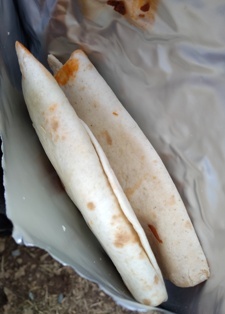 The MRE pouch was easy to open and I found two small wraps inside. I ate one with a bowl of soup and it provided a good meal. The wraps looked similar to the beef wraps, so I expected the taste to be similar too but it was quite different in taste. 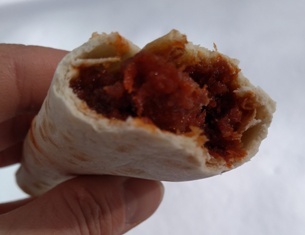 The BBQ Pork Wrap had a somewhat sweet taste as if the barbecue sauce was sweet and not tangy. I also noticed that the meat had more chunks rather than the paste texture of the beef wrap. I found them to be quite palatable but I would prefer a less sweet and more tangy barbecue sauce taste. I ate the other in the Arizona desert on an overnighter where I ate them for lunch. Again, I ate them cold and had the same experience as the first time. I like them but would just change the sauce to have more spice. 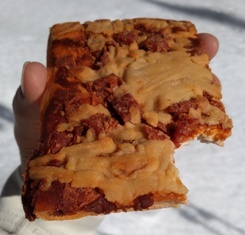 Heading out on another snowshoe day hike, I put two slices of pizza (one in each inside pocket). By the time I was ready for lunch the pizza wasn't warm by any means, but it wasn't cold either. I tore open the pouch and found a square slice of pizza that reminded me of school lunch pizza. There were small chunks of pepperoni (no slices) and quite a bit of cheese. The crust was a little doughy but quite good. When I'm burning lots of calories, I generally don't mind a few extra carbs. I ate one slice along with some soup which made a complete meal. 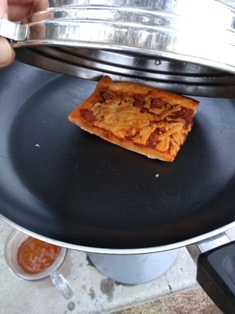 While in Arizona at a base camp, I decided to use my car-camping set-up with a large pot and propane fuel to try out the pizza by heating one slice in boiling water and by heating one slice in a frying pan with a lid atop. Both methods produced a tastier version than just eating them cold. The dough got warm and even toasted in the pan, but the cheese didn't melt with either method. As with the wraps, I didn't find the improved taste to warrant carrying extra fuel and a larger pot while backpacking. I liked the convenience of having these meals for lunch without any prep needed. The pouches are a little bulky and heavy but I would definitely be willing to carry some of them especially on shorter (less than a week) trips. 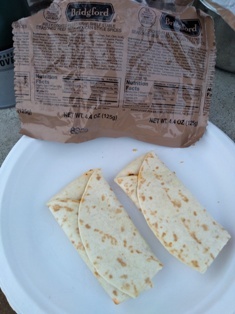 My typical lunch is a tortilla with peanut butter and jelly so the food weight isn't much different except that the MRE pouch is heavier and leaves me with more trash to pack out. I find the Bridgford meals to definitely cost more (two to three times as much) than my typical trail lunch, but I'm willing to pay for a little variety. I typically wouldn't choose the Bridgford meals for dinner since my dinners are usually homemade freeze-dried meals which are much lighter and more compact. However, in the desert or on particularly dry backpacking trips, I would be happy to carry the Bridgford products to avoid having to carry as much water for hydrating meals. I was curious about which products I could find locally, so I went to the Bridgford website to find local retailers. It wasn't clear from the retailer's website what I might find in any individual store, so I made a trip to the closest one. They had all three of these products in stock along with a handful of the Ready-to-Eat Sandwiches. I bought the Beef Wraps, Pizza and one sweet and one savory pouch of Sandwiches. Overall, I found all of the meals to be tasty and convenient especially for lunch when I want something on the go. They make a nice change-of-pace to my typical trail lunches. This concludes my Long-Term Test Report and this test series. Thanks to BackpackGearTest.org and Bridgford for the opportunity to try out these yummy meals.